Measures the concentration of sugar in fruit juice and industrial fluids. 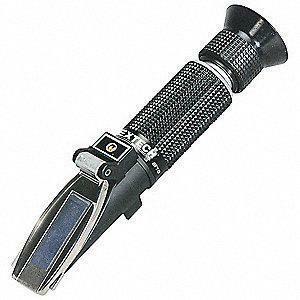 Refractometer measures the concentration of industrial fluids and sugar in fruit juice. Compact and easy to operate. Requires only 2 or 3 drops of solution and provides accurate and repeatable measurements on an easy to read scale. Prism and lens with a simple focus adjustment.